New Delhi, July 14 (KNN) The prices are increasing because of hoardings and there is a need for government to invest into warehouses to store items and keep check over price rise, said an Economist. The Whole Sale Price (WPI)Index in manufacturing sector rose by by 0.2 percent to 156.0 (provisional) from 155.7 (provisional) for the previous month. The index for ‘Textiles’ group rose by 0.2 percent to 140.9 (provisional) from 140.6 (provisional) for the previous month due to higher price of gunny and hessian cloth (2%), tyre cord fabric, jute yarn, jute sacking cloth and cotton yarn (1% each). However, the price of man-made fabric and jute sacking bag (1% each) declined. The index for ‘Rubber & Plastic Products group rose by 0.1 percent to 146.1 (provisional) from 146.0 (provisional) for the previous month due to higher price of plastic products (1%). 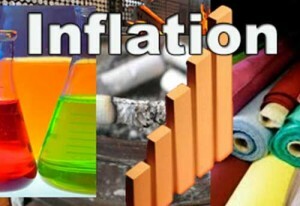 However, the price of tubes (7%) and rubber products (1% each) declined. The index for ‘Chemicals & Chemical Products’ group rose by 0.5 percent to 150.9 (provisional) from 150.1 (provisional) for the previous month due to higher price of ammonium sulphate (4%), rubber chemicals (2%) and basic organic chemicals, paints, urea, polymers, non-cyclic compound, basic inorganic chemicals, antibiotics and dye & dye intermediates (1% each). However, the price of lacquer & varnishes (1%) declined. However, The index for ‘Leather & Leather Products’ group declined by 0.1 percent to 145.5 (provisional) from 145.7 (provisional) for the previous month due to lower price of leather handbags/wallets (3%), footwear/safety boot (2%) and other leather foot wear (1%). However, the price of leather gloves (2%) and crome tanned leather and leather shoe upper (1% each) moved up. However, he said that due to hoardings the prices are increasing. This is the complete mismanagement of warehouses. Government has to invest on warehouses to keep the things stored. Food inflation would go down as monsoon is good. “It is not an actual inflation”, he added. The index for ‘Food Products’ group rose by 0.9 percent to 186.9 (provisional) from 185.3 (provisional) for the previous month due to higher price of tea dust (unblended) (5%), sooji (rawa) (4%), vanaspati (3%), oil cakes, cotton seed oil, mixed spices, wheat flour (atta), groundnut oil and tea dust (blended) (2% each) and gur, sugar, tea leaf (unblended), palm oil, powder milk, gola (cattle feed), maida and mustard & rapeseed oil (1% each). However, the price of tea leaf (blended) (5%), processed prawn (3%), gingelly oil (2%) and copra oil (1%) declined.